c.1982/83? | age 13/14? Luke must have caused panic and terror down at the rebel base, by turning off his targeting computer—just as the Death Star is about to fire! But I suppose he’ll be OK no matter whether he hits or misses. “Agh! Skywalkers’s lost his mind… we’re all going to die!” What a time to get religion. Ambivalence. At a time like this? 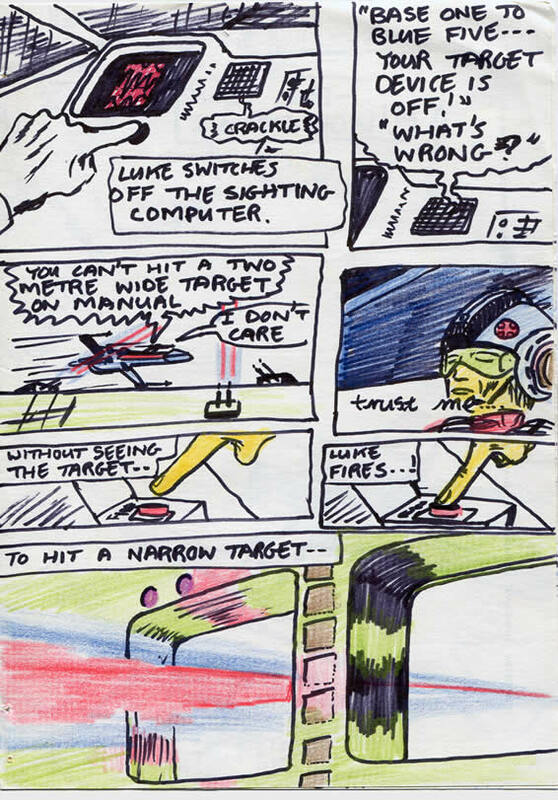 This the part of the film in which, with the Rebels mere seconds from mass-destruction: Luke switches-off his targeting computer! Having heard the ol’ echoey voice in his head again, he actually closes his eyes whilst hurtling along the trench at one hell of a whack, toward the 2 metre wide target. Eyes closed. Seconds from destruction. But it all works out in the end—with Luke’s flukey one-off shot. For which he’ll receive a medal and a promotion. Joseph Heller: eat your heart out. This page ends with a copy of Howard Chaykin’s version of the thermal exhaust port. It reminds me of the projector booth windows in cinemas—or something. It’s funny, I didn’t remember what it looked like in the actual film and copied the Marvel version. To be honest, I sometimes still get confused about what was in the original movie, what with the various tweaks that have been done to it over the years. Well done John age 11 or 12 I’d guess! Here’s hoping John White II takes an interest in a second generation completing your series (I could bribe him with more game pieces). Now that would be exciting! We did start an illustrated storybook together that involved planes, sharks and knights! 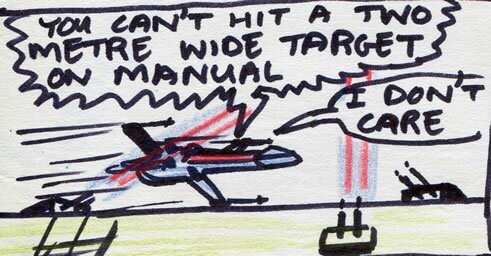 The movie exhaust port was an open hole in the deck, so the torpedoes had to make an instant 90 degree turn downwards. I don’t think Luke womp-rat-bustin g experience was anything like that! No wonder the computer had trouble with it. Did Luke have a little joystick or something to control the torpedoes’ flight, or did he just use the force, with Ben’s help? No wonder Tarkin wasn’t worried. You’re right Phil – no wonder Tarkin wasn’t worried. No wonder the rebels crapped themselves down at the base. Hey, why didn’t the rebals enter the trench closer to the exhaust port, preferrably almost on top of it. They flew several miles to get to it, it just doesn’t make sense. Nope it doesn’t. Especially if the hole was facing upwards. AGH! Can-not sus-pend dis-belief any… ungggh …longer… gasp. Did John circa 11-12 not realize that lightly colored orange make a fine white man’s skin tone or was he content with the classic Lego man shade of yellow? I know – I know… I’ve written about this before. Basically it was a case of whatever was in the pack of markers! Sometimes it was ‘Simpsons’ bright yellow! The gold/warm yellow was also what I thought people from California looked like! Sorry. Unfortunately I’m rather late to this webcomic. I intend to catch up though. I will be ready for alien, however. Love the sleeping Luke panel. Very impressed with the cursive script too. Very forcyish. I’d learnt joinedy-up-writ ing by then. Luke should either wind his window down and turn off the heater – or stop for a coffee. He could have a terrible accident.